The weight difference between bicycles and other motorized vehicles on the road means that, even at slow speeds, the impact to riders can be huge. There is no protection around riders’ bodies, so all of the impact from these collisions is absorbed by the rider instead of the frame of a vehicle. In 2011, bicycle accidents resulted in about 2 percent of all traffic accident fatalities (or 677 deaths) in the U.S.
That year, bicycle accidents reportedly caused about 48,000 injuries to riders. Since 2007, the incidence of bicycle accidents in the U.S. has been on the rise despite the fact that the overall number of traffic accident fatalities has been decreasing. Most bicycle accident deaths (approximately 30 percent) reportedly take place in the late afternoon/early evening, specifically between the hours of 4pm and 8pm. This could be because these hours are associated with rush hour/commuters making their way home from work, which means that far more vehicles are on the road during this time frame. Approximately 21 percent of bicycle accident fatalities occur between 8pm and midnight. While nearly 70 percent of all reported bicycle accidents take place in urban areas, nearly 60 percent of these collisions occur at locations that are not intersections. More than 37 percent of all bicycle accidents involved alcohol, meaning that either the driver of the vehicle, the rider or both were intoxicated at the time of the accident. 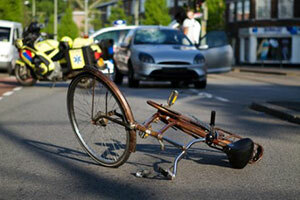 Have you been injured in a bicycle accident? If so, the skilled Denver bicycle accident attorneys at the Bisset Law Firm want you to know that we are here to aggressively defend your rights and help you secure the compensation to which you are entitled. Our experienced legal professionals are dedicated to providing each of our clients with the highest quality legal representation. While this means that we can always be trusted to keep each of our clients informed at every stage of their cases, it also means that our clients can rely on us to help them obtain the best possible results for their cases. When you choose to work with our esteemed Denver bicycle accident lawyers, you can trust that we will work relentlessly to keep your case moving and keep you advised of every development in your case. You can count on us to promptly return every one of your phone calls and to meet all of your case deadlines in order to help you secure the maximum possible compensation for your injuries and losses. Call (303) 894-8900 or email us using the form on this page to learn more about your rights and receive a professional evaluation of your case.